My Sushi World Bento Express (more info, 1258 Robson Street, Vancouver, BC, phone: 604-681-1150) is one of my friend’s favorite places to grab a quick, reasonably priced Japanese meal that will surely satisfy. The Deluxe Sushi combination ($10, pictured below) was really delicious. 9,888 views. 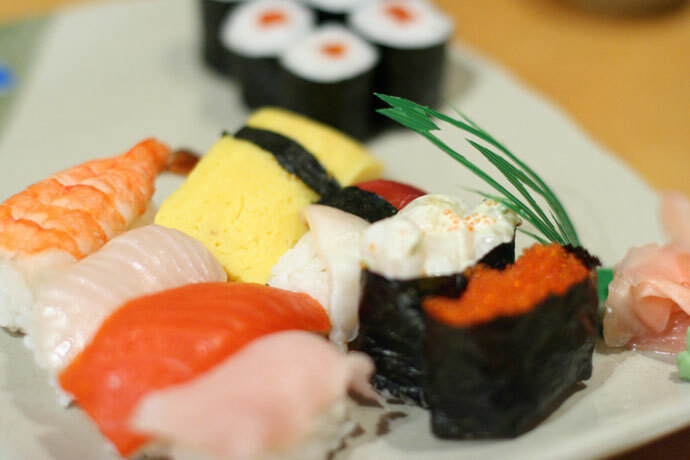 This entry was posted on Thursday, October 4th, 2007 at 9:49 pm	and is filed under Affordable, Asian, Budget, Casual, Downtown, Food Photos, Lunch, Reasonably Priced, Restaurant, Robson, Sashimi, Seafood, Sushi, Take Out, Vancouver, Vancouver Restaurants, Very low prices. You can follow any responses to this entry through the RSS 2.0 feed. You can leave a response, or trackback from your own site.